This week's (I know I haven't been too consistent lately) Free GM Resource is a bit unexpected, at least to me. I had never even heard of Google Slides until this afternoon. 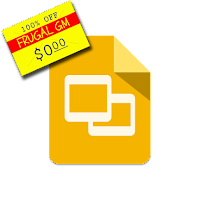 With Google Slides you basically have a free way of sharing a screen. Essentially your table can collaborate within the slide(s). You set up a background, add tokens (which can be manipulated by those you share the presentation with) and show the presentation. Combined with a projector or TV, you can easily just use this as a digital map. Forget the screen sharing and moving tokens...or that's what I would probably do. I did find a YouTube video with a quick overview.